Hi there! I hope everyone is having a good morning. Today is all about kitchen counters. Not so much what they're made of but what goes on top of them. I think decorating a kitchen is really tough because it needs to be functional. You need your coffee pot, toaster, utensils, and paper towels out on the counter so you can cook -- and those things aren't always cute. Recently, I read a couple of blog posts on how to create nice looking, yet functional, kitchen counters which inspired me to make mine a little nicer and a lot less sterile. As you can see, they're perfectly functional. 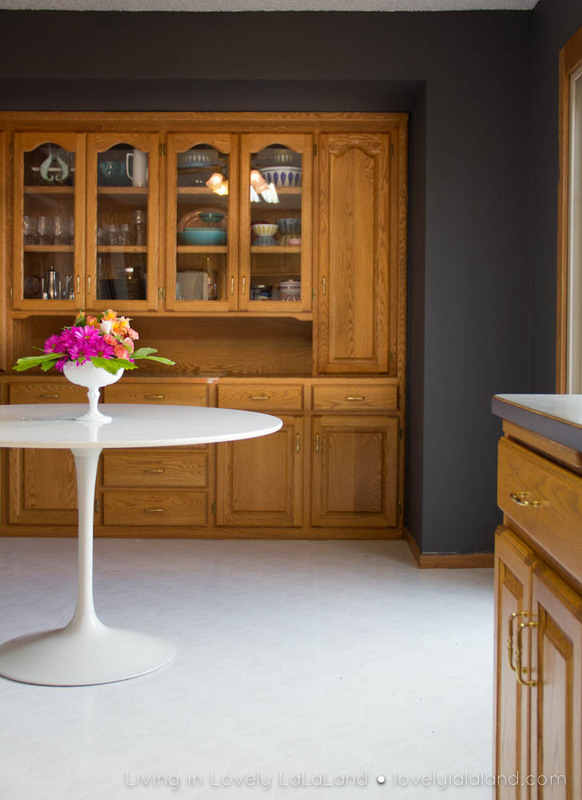 Yes, the oak cabinets shatter my white-cabinet loving heart in a million pieces every time I see them. But that issue aside, my counters needed a little something. OK, they needed a lot of something. They felt a little too ... cold and flat to me and definitely needed more style. cookbooks or cooking magazines that are thoughtfully arranged." All of this is great advice. I already had some fake plant life - a cute little faux plant (that looks real) that I bought from IKEA. I definitely want to bring in some herbs once I plant some this Spring. But for now, this works. I found a small cake stand at Home Goods for $5. I used it to prop up the fake plant behind my sink. I did not have a wooden cutting board, so I picked one up at Home Goods for about $9. I love the texture! And I love that it hides my boring laminate counters a bit. I brought in a pop of pattern and color by propping up this cute yellow tray from Crate and Barrel ($19) behind the paper towels. I found the ceramic basket at Home Goods for about $4. I put lemons or oranges in it (but had not done so in this pic), and I found this blue bowl at Crate and Barrel for $4. I'd like to put something in it, but not sure what yet. Now, the far end area of the countertop was always tough ... it is long and boring and definitely needed something. I decided to break things up by bringing in a lot of texture. I found this basket at Target for $20. It's pretty but also functional: it keeps a few things in it. Then I got out my Barefoot Contessa cookbooks and displayed them. I use them a lot, and I *love* her, and the colors work! I think I need a few more cookbooks over in this corner. I thought the idea to have cooking oils near the stove was great, too. 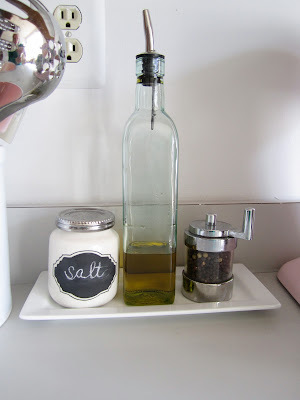 I bought this olive oil decanter at Marshalls for $3 and the small tray at Pier 1 for $4. I added my salt jar and pepper mill to the tray too. I also found some inspiration in the blog of Emily A. Clark. Her kitchen is lovely, but what I took away most was her chalkboard labels for her jars. I decided to do that in my kitchen. I bought these flour and sugar canisters at IKEA months ago. Rather than DIY, I just bought chalkboard labels on Etsy from the shop, Bradens Grace. Look how sweet! 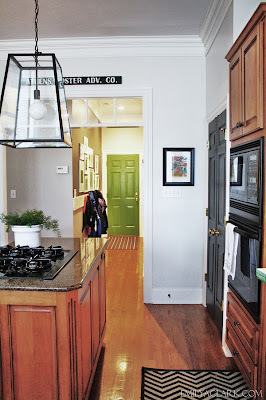 While we are on the topic of the kitchen, I'm mulling over the wall color. As you know, I plan to repaint basically the entire house as soon as I can. I know I want a soft cream or warm white throughout the space, but I was thinking of doing a different color in the kitchen and the kids' playroom. The kitchen is awash in oak cabinets, and unfortunately, I cannot change that (unless I buy this place, which ... I am seriously considering, but that's for a different post). Anyway, recently, blogger Emily A. Clark blogged some terrific suggestions for working with oak kitchen cabinets. 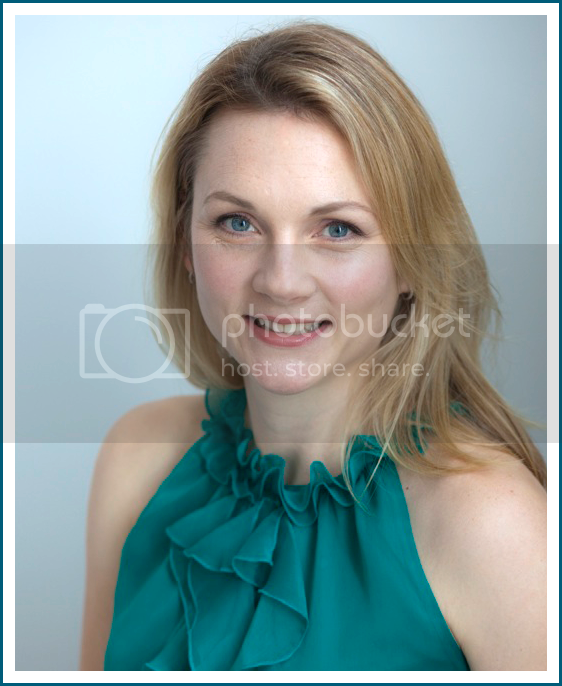 I gasped when I saw this photo she found, which was from the blog Living in Lovely Lala Land. She used Sherwin Williams Peppercorn. Sure, it's dark and dramatic, but I love how that deep, rich grey tones down the orange in the oak. My kitchen gets a ton of light and there is a lot of white in the space, so this is a definite possibility. I think the grey would play nicely with cream in the rest of the space as well. Ooh. But dark grey is so out of my comfort zone. Emily Clark herself has a kitchen with wood cabinets (though the tone is better than my blah oak) and she used a lighter color - Shoji White by Sherwin Williams. It's a warm white with some grey undertones, which would look pretty good with my cabinets and kitchen. What do you think? Should I go dark with the walls in my kitchen? Or keep them bright and light? I'd love to hear your honest thoughts. you know I love bright and light although that dark color did look awesome!! !